2 ) 3 pcs pot side measures 3.35 x 3.35 x 2.17 inch, 3 piece bamboo trays 3.74 x 3.74 x 0.47 in., 3 pieces ceramic notes tag 2.5 x 2.7 x 0.15 in. 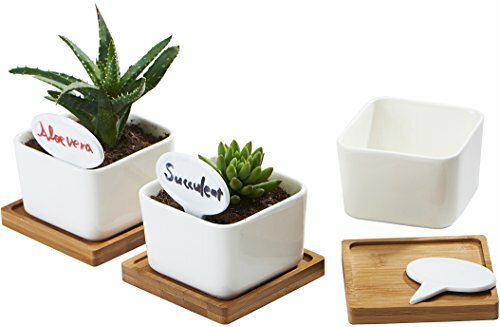 4 ) This set includes 3 pc white square high temperature made ceramics flower pots, 3pc free ceramic notes signs and 3pcs bamboo base, ideal for decorating desks, book shelves, tables, window sills, living room, outside gardening etc. 7 ) Small modern square decorative cute jars with saucer can also be used for small mini home desk ornaments kits funny container or organizer for your self, wife, husband, men, women, family.